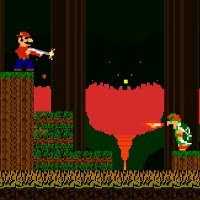 What if Mario and Luigi put on some baggy pants, backwards baseball caps, grabbed some shotguns, and teamed up with Mr. T to rescue Princess Peach from Duck Hunt’s evil dog? Developer Visual Animation Studios answers that question with the humorous 2D platforming homage, Gangster Bros.
You’ll begin by selecting one of three heroes (and no, I’m not kidding about Mr. T), and choosing a grey light-gun, a red light-gun, or a shotgun. These are pretty funny choices, but are purely cosmetic. You’ll be facing off against urbanized versions of the familiar bad guys, from skateboarding Koopas to bomber-flying Lakitus. Another notable difference is the inclusion of a “life-meter.” Enemies’ attacks will slowly deplete this meter, but it can be refilled by collecting mushrooms. Aping the 8-bit graphical style of the classic platform games, Gangster Bros. does a very competent job with its control mechanics. Instead of stomping on enemies as you traditionally would, you’ll need to ventilate the world’s hostile denizens with your boomstick. It has limited ammunition for each level. Thankfully, some helpful ammo pick-ups are sprinkled around the levels. Difficulty ramps up fairly quickly, and (like the predecessors it’s parodying) the key to success is often remembering enemy placement. The later levels will almost assuredly require multiple attempts to conquer. Complete with a final boss fight and a basic (but functional) level editor, Gangster Bros. is worth checking out, and will make most old-school gamers smile nostalgically.